This is my blog. It’s called Open World. It’s powered by Reclaim Hosting and the title is inspired by Kenneth White, Scottish poet and Chair of 20th Century Poetics at Paris-Sorbonne. Mostly I write about work, about conferences and meetings I’ve been to, presentations I’ve given, papers I’ve written. Sometimes I write about my thoughts on other people’s writing. Sometimes I write about the frustrations of being a woman working in technology. Sometimes I write about events like Open Access Week, Ada Lovelace Day, or International Women’s Day. Mostly I write about Open Education. Mostly I write because I want to; but sometimes I write because I have to. Sometimes writing is a necessity, a catharthis, the only way to process experiences or events that are too overwhelming, too infuriating, too incomprehensible to mediate in any other way. That’s when writing gets, personal and political, messy, emotional and confrontational. I seem to be writing more and more of these personal blog posts recently; after the failed Scottish independence referendum (Hearing voices), after Brexit (This time it’s different), after the US election (The wrong side of history). It was Helen Beetham who called one of these posts a shout from the heart and I guess in a way they are. There’s no denying that they’re a personal emotional response to events that seemed, that still seem, to be utterly incomprehensible to me. There’s also quite a lot of swearing involved, but I’m not going to apologise for that. So what has any of this got to do with open education? I’ve always had a strong personal commitment to open education. I believe passionately that as educators we have a responsibility to work together to improve opportunities for all, not just for a select few. I believe there is huge creative potential in openness and I believe we have a moral and ethical obligation to open access to publicly funded educational resources. These words are from the Scottish Open Education Declaration. I wrote them and you know what? These aren’t hollow words, I actually believe them. I actually have a genuine commitment to these words, and that’s why I find it increasingly difficult to disentangle my open education work from the personal and political. And to be honest, I don’t really care because never has the feminist rallying call “The personal is political” rung more true than now. I know I’m extremely fortunate to be in the position where I can write these personal political blog posts and express my opinions without fear of reprisal and I am aware that this is an incredibly privileged position to be in. It’s very easy for some of us to take openness for granted but it’s important to remember that for many there’s is also a risk associated with openness, because openness, education, knowledge all seek to challenge structures of power and control. And in talking about risk, I don’t mean risk in the abstract sense. Do any of you know who this man is? 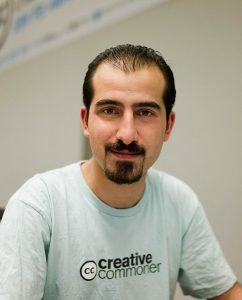 This is Bassel Khartabil a Syrian open source software developer, open knowledge advocate, Wikipedia editor and project lead for Creative Commons Syria. Bassel is also a contributor to the New Palmyra project; a digital archaeology and open data project that aims to create a virtual reconstruction of the ancient city of Palmyra, much of which has been destroyed by ISIL during the Syrian civil war. Bassel was detained by the Syrian government in 2012 and held in Adra Prison in Damacus for 3 years. In October 2015 his name was removed from the Adra prison register and despite calls from numerous human rights organisations, his whereabouts are unknown. In order to raise awareness of Bassel’s disappearance a group of open practitioners came together to write the open e-book The Cost of Freedom: A Collective Inquiry. My contribution to the book was a short piece called The Open World which touches on the personal risks, costs and benefits of openness, much like this talk today. The plight of Bassel Khartabil is a sobering reminder of the risks of openness, proof that open is always political, but it’s also shows why we need openness more than ever, because openness is inextricably bound up with freedom. And in the words of another older declaration, the Declaration of Arbroath. This entry was posted in oer, openscot, politics, Women in Tech and tagged cost of freedom, freebassel, oer17. Bookmark the permalink. ← OER17 – Come and find me!